To prepare for this literacy focus, every staff member at Eagle Rock is reading Transformational Literacy: Making the Common Core Shift with Work That Matters by Ron Berger, Libby Woodfin, Suzanne Nathan Plaut and Cheryl Becker Dobbertin, a pedagogical text that emphasizes the importance of inquiry-based learning, and suggests ways to implement Common Core standards into effective teaching methods. In the past, when our instructors attempted to implement LAC practices, they found success in improving student reading comprehension, yet found it difficult to create something enduring and consistent that could stand the test of time. By fully engaging all of Eagle Rock’s staff, we hope to generate something that will become as engrained in Eagle Rock’s instructional fabric as our workshop models and learning targets. In that spirit, the Professional Development Center (PDC) team has done something out of the ordinary. They’ve made the LAC annual focus their yearly school improvement project, effectively moving all of Eagle Rock School toward the same objective. The team that conducts the professional development sessions to implement LAC is known as the Professional Development Critical Friends Group (PDCFG), which welcomes all instructors to attend each session. In these sessions, instructors learn and teach by way of sharing and reading directly from classroom work. The PDC team has been working closely with the PDCFG to create and implement an annual instructional professional development. This in turn, will help them closely examine classrooms and determine how they are asking students to find evidence to back up their claims. This establishes a benchmark from which to work. To further assess students, more focus is being put on the College and Work Readiness Assessment (CWRA) results. Unlike typical standardized tests, the CWRA looks into a student’s ability to think critically and communicate effectively through writing. This helps gather more effective quantitative and qualitative data on student literacy as well as increase the quality of instruction and support for students in their literacy practices. The year is off to a great start, and everybody at Eagle Rock is excited to buckle down and create systemic change within the school’s teaching method. With the energy put into Literacy Across the Curriculum, we will graduate more students who are committed to changing the world. And, hopefully, increase every student’s engagement in regards to literacy and comprehension. 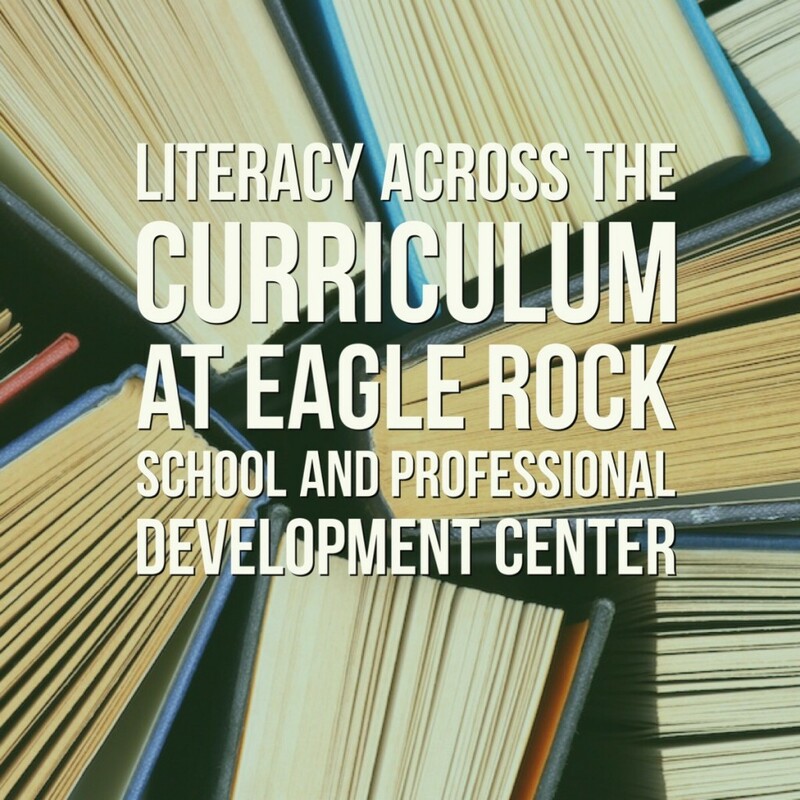 This entry was posted in Eagle Rock Curriculum, Eagle Rock School Classroom and tagged Cheryl Becker Dobbertin, CWRA+, Libby Woodfin, Literacy Across the Curriculum, Ron Berger, Suzanne Nathan Plaut.